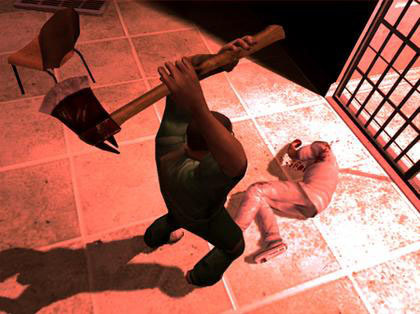 A Sony Entertainment Europe employee has been fingered for the warez leak of Manhunt 2. The as-yet-unreleased ultra-gorey game is the source of the latest fracas over violence in video games — a media cycle which more often than not transforms otherwise unmemorable titles into best sellers under the sheer weight of public outrage. Last month, word got out that an uncensored beta of the game leaked into various BitTorrent sites. The warez build allowed gamers with modded PS2s to play the entire AO-rated version of Manhunt 2, made before Take-Two toned down the violence to placate government censors. After reports of the breach made its rounds, Game Politics began sniffing for clues of the source. Its investigation revealed the culprit was an employee of Sony Europe — who apparently has already been sent packing after the developer got wise. "Take-Two Interactive has confirmed that a former employee of Sony Computer Entertainment Europe (SCEE) has acknowledged his responsibility for the unauthorized online distribution of an unrated play-test version of Manhunt 2 submitted for the European PAL PlayStation 2 computer entertainment system." The name of the employee and circumstances of the code falling into the wrong hands remains unknown. Manhunt 2 has effectively been banned from the UK after the British Board of Film Classification (BBFC) refused twice to grant the game a UK rating — determining it "unacceptable" over the fine point that it "constantly encourages visceral killing." While the status of Manhunt 2 is still up in the air for Europe, the re-rated version of Manhunt 2 for the PS2, Wii and PSP will hit US store shelves on Halloween.